Todd Rundgren fans will have only two chances this year to see him perform his classics and fan favorites with a full orchestra. Both of the Todd Rundgren concerts with the Akron Symphony Orchestra will take place Labor Day weekend in Akron, OH. Rundgren performed with the Akron Youth Symphony Orchestra and Akron Symphony Orchestra in front of a packed house at the Akron Civic Theatre in 2013. 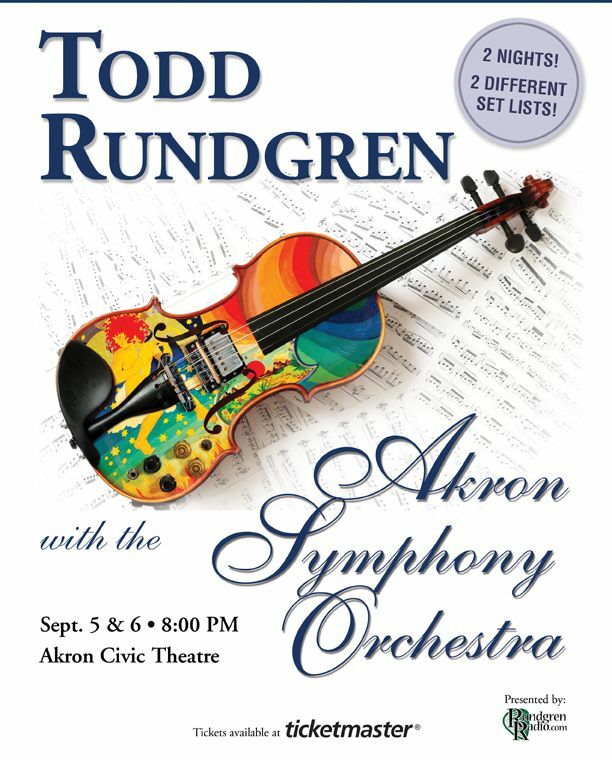 AKRON, Ohio - Aug. 4, 2015 - PRLog -- Todd Rundgren will be performing with the Akron Symphony Orchestra on September 5th and 6th of 2015 in Akron, OH. The set lists will vary some each night and fans are being encouraged by the promoters to go both nights or risk missing some classics they've waited decades to hear Todd perform live. "There will be 14 songs performed over the weekend that Todd has never performed with an orchestra", said Melinda Cain from Rundgren Radio. The concerts are being held at the Akron Civic Theatre, a venue dubbed, "The best damn rock concert venue" by BangAGong blog writer Doc Lehman. The concert is being presented by RundgrenRadio.com and tickets are available at Ticketmaster.com for both Saturday and Sunday's performances. As a bonus for fans, the promoters added some special guests to perform with Rundgren and the Akron Symphony Orchestra. Kasim Sulton, a member of the band Utopia (with Todd), will be the bass player and also one of the three background singers. The other two background singers will be Mary Lou Arnold, who toured with Todd during his popular A Cappella tour as a member of the 11 piece choir, and Michele Rundgren, who toured with Todd during the Nearly Human and A Cappella tours. Kevin Ellman, a member of Todd Rundgren's Utopia, will be the drummer. Greg Hawkes, a member of The Cars and The New Cars (with Todd), will be the keyboards/piano player. Jesse Gress, Todd's longtime touring guitarist and former Editor of Guitar Player magazine will the guitarist. Born and raised in Philadelphia, Todd Rundgren began playing guitar as a teenager, going on to front The Nazz, the quintessential 60s psychedelic pop group. In 1969, he left the band to pursue a solo career, recording his debut album “Runt”, but it was 1972's seminal “Something / Anything?” (on which he played all the instruments, sang all the vocal parts, and acted as his own producer) that catapulted Todd into the limelight, prompting the media to dub him "Rock's New Wunderkind." This was followed by such landmark albums as “A Wizard, A True Star”, “Todd”, and “The Hermit Of Mink Hollow”. In 1974, Todd formed Utopia, who were on the cutting edge of progressive rock in the 70s, and developed into a very tidy power pop outfit in the 80s (as evidenced by such early MTV hits as "Set Me Free" and "Feet Don't Fail Me Now"). As a songwriter, video pioneer, producer, recording artist, computer software developer, conceptualist, and interactive artist, Todd Rundgren has made a lasting impact on both the form and content of popular music. Among his myriad of hits are "Hello It's Me", "I Saw the Light", "Can We Still be Friends", "We Gotta Get You A Woman", "Open My Eyes", and "Bang the Drum" (the latter a mainstay on ESPN and in television commercials). Rundgren's prolific producer's discography includes such classics as Skylarking by XTC, We're an American Band by Grand Funk Railroad, War Babies by Hall & Oates, Wave by Patti Smith, and Meat Loaf's auspicious debut Bat Out of Hell (the fifth best selling album of all time with some 42 million sales). Sealing his reputation as rock's renaissance man, Rundgren composed all the music and lyrics for Joe Papp's 1989 Off- Broadway production of Joe Orton's “Up Against It” (the screenplay commissioned by The Beatles for what was meant to have been their third motion picture), as well as the score for “Dumb And Dumber” and a number of television series, including “Pee Wee's Playhouse” and “Crime Story”. He is also internationally acknowledged as the Godfather of the marriage of music and multimedia. Few artists have been as fearless and groundbreaking - nor possess such an expansive and exceptional body of work - as Todd Rundgren has throughout his career. Widely recognized for musical excellence and performance versatility, the Akron Symphony Orchestra is committed to enhancing the quality of life of their community through educational and musical excellence. The Akron Symphony Orchestra is operated by the Greater Akron Musical Association (GAMA). GAMA’s vision is to be embraced and sustained as a community treasure that provides a welcoming environment for all people to experience great music. This vision is realized by operating the Akron Symphony Orchestra, Akron Youth Orchestras, Akron Symphony Chorus and the Gospel Meets Symphony Choir, along with numerous special outreach and educational programs. The Akron Symphony Orchestra began in 1949 when Mabel Lamborn Graham received $500 as “seed money” from the publisher of the Akron Beacon Journal with the instruction to begin raising money for a professional, union orchestra. After three years of intense fundraising, spearheaded by Mrs. Graham and other dedicated volunteers, the Akron Symphony’s Classic Series was established in the organization’s first season (1952-1953) to provide concerts performed by professional musicians of the highest caliber. Guest conductors and soloists of regional and national stature have been an integral part of the Classic Series since its onset, and remain a high priority for the Symphony. The Akron Civic Theatre, built in 1929 as Loew's Theatre, is a theater in Akron, Ohio. It is one of only sixteen remaining atmospheric theaters designed by John Eberson in the United States and is an excellent example of the great movie palaces of the 1920s. The Akron Civic Theatre is the last remaining theater of 11 opened by Marcus Lowe, founder of the Lowe's theater chain. The Civic is located on South Main Street in Akron and seats 2,480 people. The theater has been exhibiting shows and special events for about eighty-five years. The Akron Civic Theatre regularly hosts a vast range of up & coming local, national and international talent. They’ve been honored to host KISS, Fleetwood Mac, Mott The Hoople, Suzi Quatro, Bruce Springsteen, Glass Harp, Cream, Pink Floyd, Aerosmith, Sammy Hagar, Starz, Artful Dodger, Foghat, Bad Company, Rush, Alex Harvey Band, Triumph, Montrose, Todd Rundgren's Utopia, BB King, Michael Stanley Band, Artful Dodger, Robin Trower, Sweet, The Baby's, Little Feat, Blue Oyster Cult, Journey, Hall and Oates, The Black Keys, DEVO, The Motels, Rick Springfield, Peter Frampton, Alice Cooper, J. Geils Band, Casting Crowns, The Pretenders, and so many more incredible artists. Rundgren Radio is a fan based online talk radio show for Todd Rundgren and music fans that aired weekly for 4 years from 2007-2011 and now airs occasionally for special edition shows. All Rundgren Radio shows are permanently archived and can be downloaded. Rundgren Radio has completed over 200 online radio shows with over 100 different guests and over a million downloads. They have also presented over 30 Todd Rundgren concerts.